Our Premium Yellow Chrysanthemum Cushion Flowers are abundant this season. The radiant blooms represent new beginning and a warming passion. Few flowers can compete with the beauty of the Yellow Chrysanthemum Cushion Flowers. Our Yellow Chrysanthemum Cushion Flowers are available for immediate delivery. When you're celebrating your anniversary, you want a flower that revitalizes your celebration. Yellow Chrysanthemum Cushion Flowers are the perfect pick to gift your significant other with on your anniversary. We carefully grow our Yellow Chrysanthemum Cushion Flowers and other flowers. There is never a need to worry about quality when buying flowers for delivery online with us. 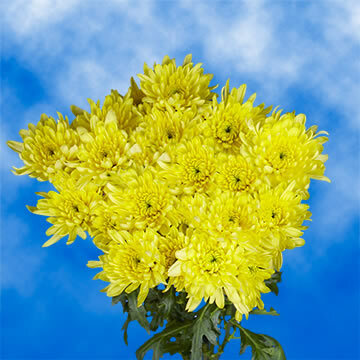 We guarantee the freshness of our Yellow Chrysanthemum Cushion Flowers. We make the task of ordering flowers quick and easy. All of our Yellow Chrysanthemum Cushion Flowers are grown in our eco-friendly greenhouses, where we carefully nurture and develop all of our flowers. You are guaranteed freshly cut flowers when ordering with us.